After several years working in masonry , Christian undertook the development of farming and restoration of the buildings. After 25 years of work, his son Olivier joined him. Today, Christian is happy to share his experience and pass on his knowledge to visitors and guests of the estate. Eglantine joined her brother on the farm : The GAEC (Groupement Agricole d’Exploitation en Commun) was established in 2010. In love with nature and authenticity, technician agricultural and forest management. She also studied at the University of Wine, enabling her to look after the commercial side of the Domain. 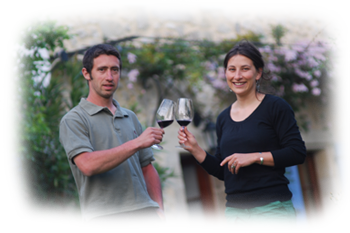 As a warm and friendly person, she will be happy to help you discover our wines at trade shows, fairs and markets.